Vinyl Theatre’s Keegan Calmes is as chipper as he can be on a long van ride back from Virginia to the band’s home territory in Milwaukee, Wisconsin, answering the phone with a bright, “Hi, how are you doing?” After the 2014 the band had, he has all the reason in the world to be happy—even while crammed in a van for hours on end. 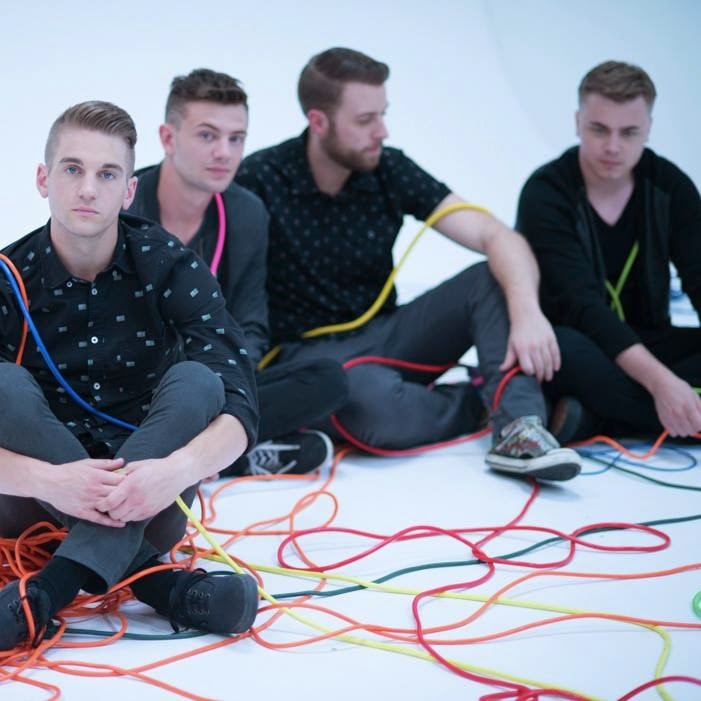 The band started when Calmes started writing with Vinyl Theatre’s keyboard player in high school and college. They kept writing together throughout college and met their drummer that way as well. After college was over, they dove right in and got whatever job they could to support them while they tried to pursue music full-time. Now, the goal is to just keep putting out albums and staying with it for the long haul. This isn’t a band that’s going to have one album and decide to leave music. “I feel like as a band, we ultimately just want to keep growing and put out a really good lineup of records, each record being a little bit more distinctly different from the last,” Calmes says. When it comes to influences and inspirations, Calmes says that he and his band mates are like “human sponges,” absorbing just about everything to incorporate into their own music. Vinyl Theatre is inspired by everyone from modern bands similar to them, like twenty one pilots and Paramore, to EDM like Cascade and deadmau5, to older, classic rock bands like Supertramp and Rush. Each member of the band brings their own influences, and they all come together to create the sound of Vinyl Theatre. They’re trying to switch their sound up and do something a bit different from the other bands you’re used to hearing in this genre. “If anybody hears our music and thinks it stands out, I feel like maybe it’s the energy that we put into it. If they see a show, we definitely exude the same energy that you hear in the music,” Calmes says. The band are doing some college shows in the spring, a show in Chicago with New Politics, and a hometown release party for a local radio station that’s creating their own beer. It was also just announced that they’re going on a spring tour with Magic Man. Calmes says if they could pick anyone to tour with, though, it would be Paramore or Fall Out Boy because “they’re super amazing legends” and since they’ve been around for so long, Vinyl Theatre could learn a lot from them. Calmes is excited for the start to 2015, and emphasizes how ready the band is to be back on tour and getting to see their fans. “Hopefully the fans can be patient and wait to see us, because we’re dying to see them as well,” Calmes says.